Another lovely morning greeted the 253 of you who took part in the 316th Graves parkrun this week. Jo was our expert run director again this week with her army of v=wonderful volunteers including Mark who was pacing 30 minutes this weekend. 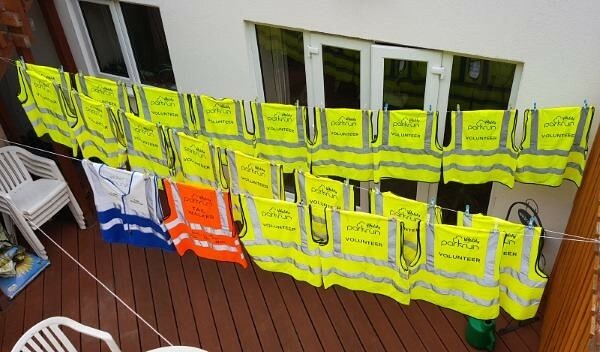 A special thanks to Andy for washing all of the Graves ParkRun hi-vis jackets. All our marshals will be looking smart and smelling sweet for Graves ParkRun number 317 this coming Saturday. You may have noticed several balloons this week and LOTS of cake! Congratulations to Richard JACKSON on his 50th, Catherine NEEDHAM and Sarah HOWSON (Me!) 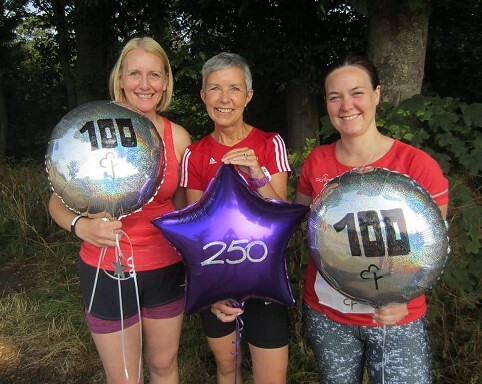 on their 100th, and Jane EVANS on her 250th parkrun. So you may think what a coincidence that myself and Cat reached 100 on the same day! I’ll have you know this took precision planning once we realised we were close, we worked out dates to coincide with a birthday weekend too – Happy Birthday Cat. If you read last week’s report you’ll have read about Claire and Jayne. Not to bore you again but my story is similar. I’d run parkrun a couple of times but gave up and then in Oct 2014 I came back and fell in love with running. I’ve now run 100 runs, 94 of them at Graves. I went to Gav’s unofficial hill and speed sessions one Tuesday night some 2/3 years ago where I met Catherine for the first time. We discovered we had similar pace and got chatting that night (when we could breathe!) and agreed we’d be back the following week. We started running together at parkrun on Saturdays and then started to run outside of that. We matched each other quite well and often manage to motivate one another at different points, spurring each other on. We have decided we both love winter training and can often be found in rain, wind and snow running around Sheffield. 3 and a bit years down the line we are now firm friends, have run lots of races together and have even ventured out in ‘normal’ clothes for several evenings out. 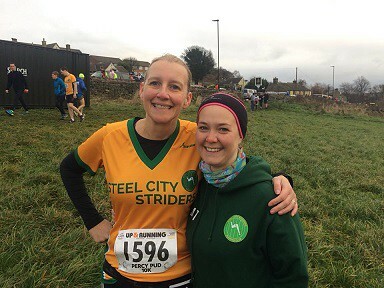 We have both made so many friends through parkrun and the Striders and I just want to thank everyone at Parkrun for being so great. Graves is definitely the best. There were 37 first timers this week with 8 runners completing their first ever parkrun. Congratulations to you all! For those who don’t currently receive the volunteer e-mails, if you follow the ‘manage my profile’ link in your results e-mail, you will find an option to ‘opt in’ to the e-mails. We won’t bombard you don’t worry! Well not unless we’re really desperate!